Pablo Rubin-Jurado, was born in Honolulu in November 2001. He currently attends the Professional Performing Arts High School. He has been a part of the Juilliard Pre-College program since 2013. He is currently a vocal major, studying voice with Lorraine Nubar and Cynthia Sanner, composition with Eric Ewazen, violin with Khullip Jeung, and piano with Ernest Barretta. He has also been in the New York Youth Symphony Composition Program since 2015. 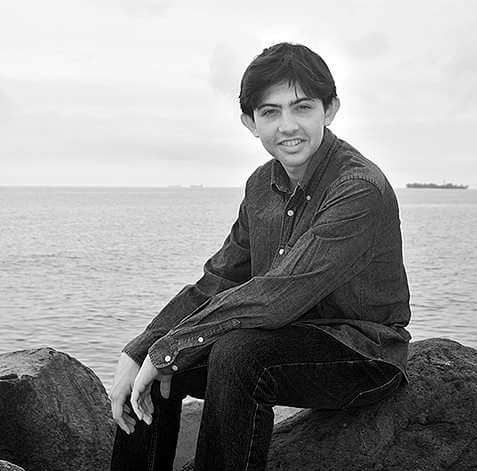 He began violin at age 5, winning first place in the 2010 and 2012 Hawaii Music Teachers Association's violin competitions, and first place in the Honolulu 2012 Mozart Festival. In November 2012, Pablo sang the role of “Amahl” in "Amahl and the Night Visitors" by Gian Carlo Menotti at the Hawaii Performing Arts Festival (HPAF). In November 2013, he was the understudy for the role of "real Jake" in the Metropolitan Opera production of "Two Boys" by Nico Muhly. He was an invited guest artist at HPAF in 2014, where he sang the role of “Miles” in “The Turn of the Screw” by Benjamin Britten. In the American Protégé International Voice Competition, he won first place and a judges’ distinction award in 2014 (as a boy soprano), and a second place in 2016 (as baritone). In 2017, he was selected and sung for the 10th Anniversary Showcase at Stern (Carnegie Hall). He will sing again at Stern for the competition’s Summer gala in 2018 (as a tenor). In 2017 he also won 2nd place in the “Early Teen Voices” category in the Hal Leonard Vocal competition, and was 2nd place in the high school division of the New York Lyric Opera competition, and he will take part in the Gershwin International Music Competition’s 2017-2018 Outstanding Young Artists’ Concert Series. He has had many of his compositions performed at the Juilliard Pre-College composer’s recitals, as well as with the New York Youth Symphony Composition Program at Symphony Space. He has attended many summer camps, within others, the Meadowmont School of Music for violin, and the Boston University Tanglewood Institute for voice.